High-tech thread can help customs officials detect knockoff designer clothes. Clothing counterfeiters beware—researchers in Sweden have created a high-tech thread that can be woven into clothing patterns and detected with a polarization filter. This means counterfeit clothing and bags may soon be identified rapidly—before it even enters the country—no matter how good the knockoffs look to the human eye. But technology that combats counterfeiting doesn’t just help line the pockets of Louis Vuitton and Marc Jacobs—it enables us to improve working conditions for many of the world’s poorest people. After the factory collapse in Bangladesh, Disney decided to pull its manufacturing out of the country. This changed the conversation from how awful the tragedy was to the finer points of how to go about fixing it. When big companies get caught engaging in horrific labor practices, we can blame someone, picket them until they right the ship. 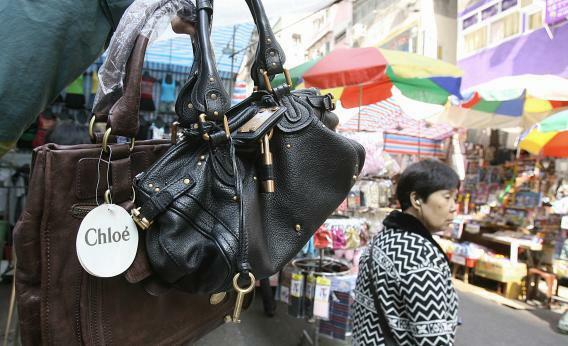 But the companies who make counterfeit goods aren’t beholden to international outrage. So long as their products make it to our shores and the demand for knockoffs remains high, their sweatshops continue to hum. And by hum, I of course mean break the legs of children so they can focus on making handbags. Which is why it’s good that researchers at Chalmers University of Technology have created an easy way to immediately spot the difference between authentic and knockoff materials. The thread is composed of polyethylene and “a dye molecule that absorbs visible light.” This means that when it’s woven in with the product’s other materials, the special fiber can be arranged into all sorts of patterns without affecting the visual appearance of the product. That is, until it’s viewed up close under a polarization filter—think: polarized sunglasses—whereupon the pattern jumps out. The beauty is, this technology is far more difficult to replicate than a label. The technology will work on synthetic materials like nylon as well as natural ones, such as silk and wool. Brands will even be able to customize their secret patterns to form logos. The researchers demonstrated this by creating teeny, tiny smiley faces with their test thread. According to a press release, the technology is ready for implementation, as Swedish Customs already has the equipment needed to recognize the patterns and the thread is “easy and inexpensive for a company to produce.” It will simply take a savvy designer to start utilizing the thread in their designs and a conversation with regulators about what to look for. Security aside, I’d be surprised if some savvy designer doesn’t adopt the technology for the sake of branding gimmicks. Obviously, a few special threads aren’t going to put an end to unfair labor practices in far off places. As consumers, it’s on us to make better decisions about where our products come from, and it isn’t just those bargain shoppers buying scarves in Chinatown. Traffic of counterfeit goods has become especially bad over the last decade as the Internet makes such products available to a wider audience. (I don’t even want to think about how many off-brand phone chargers and adapters I’ve had to buy over the years and where they might have come from.) But giving border and shipping officials a surefire way to spot fakes is a good way to start.